The Octagon Hall, a 330-sqm fully air-conditioned indoor venue with a seating capacity of 150-200 guests for wedding and debut set-ups, up to 250 for regular sit-down functions and up to 350 for cocktails. The Octagon Terrace (150 sqm) & Garden (80 sqm) for outdoor settings. Protected with a permanent tarp roof, the Terrace is frequently used as an extension area for the buffet station, registration table, photo booth, mobile bar and cocktails. The garden behind the terrace makes a lovely setting for a wedding ceremony. Private Lounge with powder room, sala set, mini dining table, make-up counter and front and back doors, ideal for a ​pre-event holding room. Air-conditioned restrooms with a spacious hallway. The Garden Trellis (42 sqm) on the left-side garden. Featuring a polycarbonate roof and hanging plants, it's another option for pre-dinner cocktails, additional table set-ups or a garden wedding ceremony. Ample parking space for up to 500 vehicles. Attractive all-inclusive party packages in partnership with top accredited caterers. 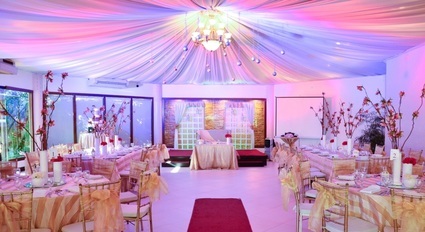 Most affordable venue rental rates in a premier location. 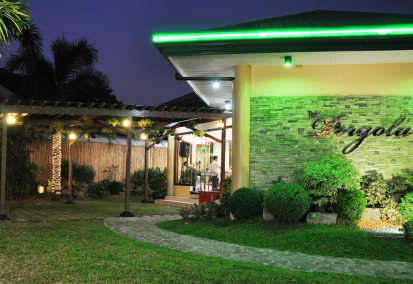 Within exclusive and secure compound easily accessible through Metro Manila's main thoroughfares.